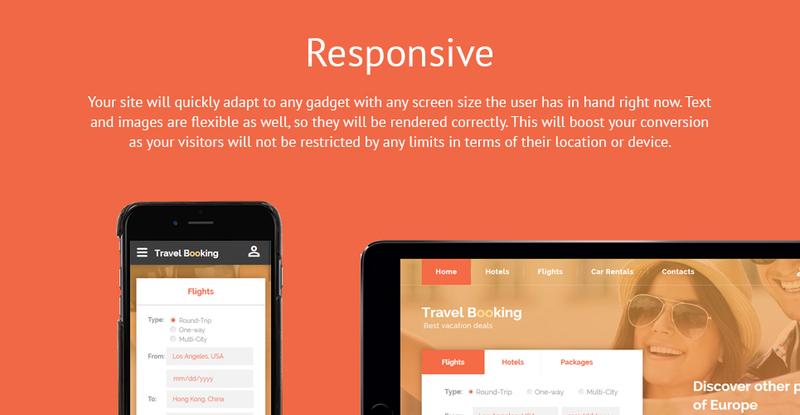 Travel Booking is a responsive website template built with the latest version of Bootstrap. It is supplied with an amazing choice of multipurpose forms that are necessary for any professional travel website. The flawless design of this template features crisp transparent content blocks, a warm color palette, nice hover animations and ghost buttons. You can showcase your best offers with a variety of widgets, banners and predesigned pages, provide customer support via live chat, and accept orders automatically. Travel Booking website template is mobile-friendly, which means that all your visitors will be provided with unmatched user experience. Kind of shops:This responsive website template will work best for Travel, Hotels, Real Estate, and Transportation websites.